Girlfriend is Rebecca. Absolutely AMAZING! Went by Bubba then, so John or Bubba is fine. Many call me Fletch. Watching favorite movies, occasional golf or tennis, having good conversations with friends, and travel. Doing whatever Rebecca asks me to do. Cathy Munson convinced me that we deserved to skip out on class one day during May of our senior year, so we went down to Forest Park and rode the train and just hung out, doing nothing. Tennis trips were great, particularly my soph year -- we had a great team. Other great memory: being a member of PSOP and having dinner before or after football and basketball games at Bonanza on University Drive. It was just fun to hang out as a group, especially any time that we beat Arlington Heights! Started playing tennis during elementary school (Alice Carlson). John Wortham's father gave my first lessons and got me interested. Dance lessons from Leito's Studio -- I was terrible and afraid of girls back then. Still am. 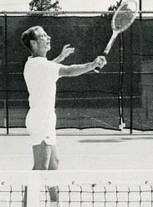 My daughter once asked me, "Dad, just how good were you in tennis?" I replied that i was INDIRECTLY the #1 tennis player in the world. When I was 18, I beat Tommy Roberts (then 16). When he was 14, he beat Dale Ogden (then 12). At 16, Dale beat Jake Ward, who had a win over Jimmy Connors, who had wins over Pete Sampras, who was the #1. So, indirectly, I have wins over Connors, Sampras, Roddick, Federer, Nadal and everyone else! The Bible; Dave's Way (about Wendy's founder Dave Thomas); Halftime by Don Buford; Appetite for America; Being Rapoport by Bernard Rapoport (old friend); Raving Fans by Ken Blanchard. Favorite newer book is The Go Giver -- it's absolutely incredible! Bermuda -- totally secluded, stunning views. This time I want to stay at the Reefs Hotel. Loved the views, food, leisure and golf. 1. Saw my old PHS history teacher Dean Cozine (IT CAME TRUE in 2014-- Brought him to the Friday reception and Saturday zoo party) to tell him the profound impact that he has had upon my life. 2. See the group IL DIVO live in concert in a real outdoor coliseum. 3. Attend Wimbledon tennis championships. 4. Return to play in the Vancouver Open, the second oldest lawn tennis tournament (behind Wimbledon) in the world -- have already played there twice. 5. Have lunch with Warren Buffett. 6. Play 18 holes of golf with stunning view on each hole. 8. Fly again in a stunt airplane doing barrel roles and other maneuvers (have done once, want to do it again). John Fletcher has left an In Memory comment for his Profile. Liz always had such a friendly smile and was so nice to everyone at Paschal. We will definitely miss seeing her. I'll keep Liz and her family in my prayers. John Fletcher posted a message. I am really looking forward to our 50th reunion this spring. Thanks to the incredible work that our classmate Sue Bailey has given over so many years to bring us all together and the committee that Ned James is leading, we owe it to ourselves to make this a priority and have an amazing time. The Class of '69 truly is... SO FINE! John Fletcher updated his profile. View. John Fletcher has a birthday today. I was so sorry to hear about Jimbo's passing. We were neighbors two doors down from each other on Medford Court E. We used to race about a quarter mile (it seemed like 2-3 miles at the time as kids). I would go slow and steady and Jimbo would sprint and then walk. It was really intimidating to race him. He always won. In this case, the hare beat the turtle. He was always nice to me and had this incredible smile! John Fletcher has left an In Memory comment for Don Poe. Don was always one of those popular guys who was friendly and kind to everyone -- I never heard him say anything unkind about anyone. God must have needed a fighter pilot and leader in heaven! John Fletcher changed his "Then" picture. John Fletcher changed his "Now" picture. If you had the good fortune of taking Dean Cozine for History or Government, I hope you attend the reception to honor him on Friday night, June 20, 5-7pm at Mac Churchill's home. I've exchanged several emails and phone calls with Dean and he is truly humbled that so many of us are interested in him. If you had friends or family attending PHS from 1963 to 1970, please invite them to attend. Reception cost is $50/person with proceeds going to start a scholarship in his honor. See you there!